You have to win the three girls inthewell-known board game.In the final you will find an extra game mode.Good luck! Play Durak online with your friends and colleagues. Дурак онлайн isfun! Implementation of Durak card game. Why is it better? 1) Smart logicwhich is based only on math. No cheating! 2) No integration withsocial networks; 3) Awesome user interface, ability to select acards deck. Durak russian, passing, throw-in, offline The main feature of thegame durak thrown-in, passing is a enough strong artificialintelligence that will not let you get bored for many parties. Thisalgorithm has already appreciated by many users of the game durak.Some people liked it so much that they compare it to the algorithmwith a live person. Especially you like the ending, when thealgorithm begins to remember what came out trumps in retreat, andwhich is still in his arms, and thus at the end of the game becomeseven more acute. But also should be noted that the algorithm is thegame durak playing without cheating: the player's not spying whencalculating a card, the cards themselves are not manipulated, deckon hand during the game does not change - all to be honest! 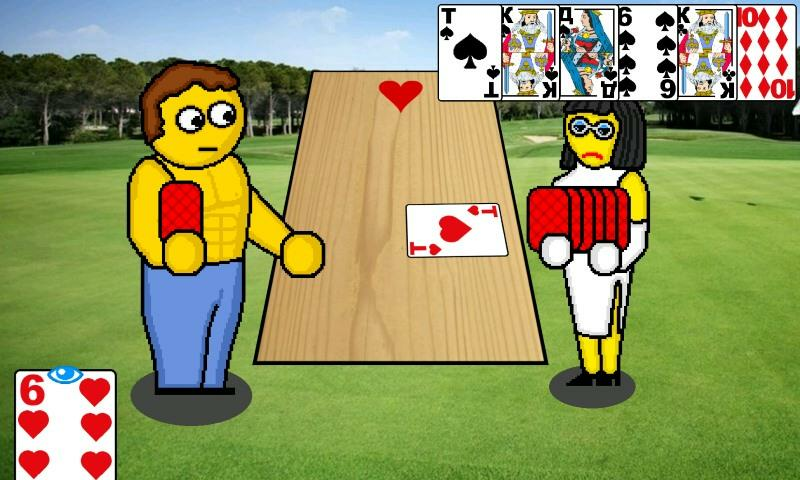 Alsocarefully made the rules of the game durak, such as for example -the first rebound of 5 cards at the end of the computer does notthrow more cards than it is at the hands of the first-throw-playerafter lights take the first to the deck, in the distribution of 5cards of the same suit is automatically retransmitting, if thecomputer has decided to take it is possible to throw another, andetc. (a more detailed description of the rules can be found inWikipedia). Also, the game durak thrown-in has very good graphicsand smooth animation, made for on the HD screen, FullHD and above.The availability of high quality traced 4 decks of cards with"jackets/shirts" for them. But at the same time, the game looksgood and at a lower resolution screens (and size) due to high cardsused in the game durak. All decks are designed for a game in 36cards and 52 cards (for those who like to play a little longer).Images of decks, "jackets / shirts", and background tables may bemixed in any combination. Management in the game durak does withswipe (swipe / slide). Swipe to the right in the playing areaallows you to fold at all clear, swipe in the direction of theircards (swipe down) allows us to take the card and swipe in thedirection of the enemy - gives him an opportunity to take. Itallows you to play carefully and remember the cards that have comeout in the retreat. More details how to play can be found onyoutube. Features: - computer does not look in players cards andplays without cheating; - player cards can now be placed both belowand above the playing area; - there are maximum 6 players in thegame; - there are 4 photorealistic decks in the game; - there are 5photorealistic background tables in the game; - support offlinemode, without internet (wifi); - save current game and continuelast game; - during phone call - game will be continued after; -large size of cards good looking on smart-phones and tablets; -support English and Russian languages; - support 52-cards deck and36-cards deck; - support HD, FullHD and higher resolution.